Las Vegas police say a man charged at a police sergeant before he was shot and killed at an apartment complex near Tropicana Avenue and Boulder Highway Wednesday night. 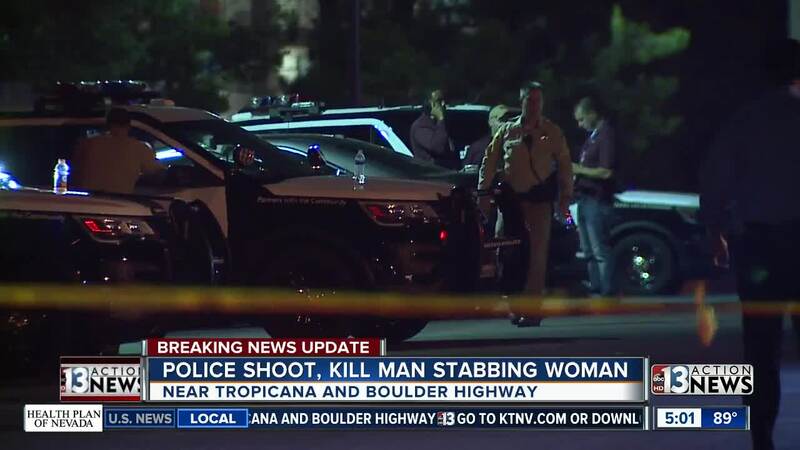 Las Vegas police say a man charged at a female police sergeant before he was shot at an apartment complex near Tropicana Avenue and Boulder Highway Wednesday night. The officer has been identified as Sergeant Daniella Cino. Sergeant Cino is 34 years old has been employed with the LVMPD since January, 2007. She is assigned to the Community Policing Division’s Southeast Area Command. Investigators say the lone sergeant was responding to a call of the suspect attacking a woman around 9:05 pm. The man reportedly followed commands to get off of the woman, but police say he charged at the officer. The police sergeant opened fire. The man was pronounced dead at the hospital. Police say the woman who was being stabbed is stable. Her exact condition is unknown. This is the 14th shooting involving the Las Vegas police department in 2018. The man's name will be released by the coroner after relatives have been notified. Sergeant Cino has been placed on routine paid administrative leave pending the outcome of a review of this incident. UPDATE 10:30 PM: Police sources say a man was stabbing a female when police officers arrive and that is when they shot the man. The man was taken to a local hospital where he was pronounced deceased. The victim was also transported, but her condition is unknown at this time. ORIGINAL STORY: The Las Vegas Metropolitan Police watch commander is reporting that another officer-involved shooting occurred Wednesday night on the 5300 block of East Tropicana Avenue, west of Boulder Highway. 13 Action News has a crew at the scene and we will update this story as more details are released.